John W. Mack served as a Commissioner on the City of Los Angeles Planning Commission. Mayor Eric Garcetti appointed him to the Planning Commission in September of 2013. From 2005 to 2013, Mack served as a Los Angeles Police Commissioner. He was appointed to the Board of Police Commissioners by Mayor Antonio R. Villaraigosa in August of 2005. He held the position of President of the Police Commission for two consecutive years, and then the position of Vice President for two years. In 2009, he was re-elected to the President post and served for two years. In 2011, he was once again elected to the Vice President post. Mack held the position of President of the Los Angeles Urban League from August of 1969, until his retirement in 2005. 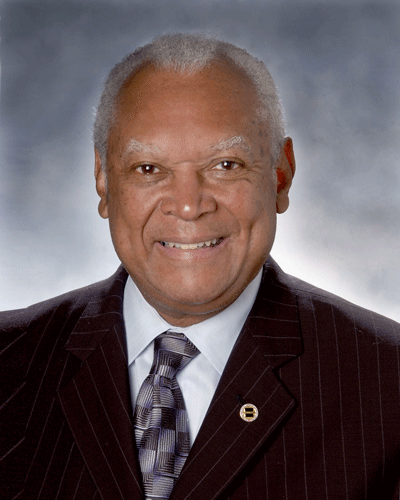 He began his career with the Urban League in Flint, Michigan in 1964 and was appointed Executive Director in 1965. Prior to heading the Los Angeles Urban League, he served on the Urban League’s National staff for six months during the Whitney Young era in Washington, D.C. Mack was a leader in the 1960 student civil rights movement in Atlanta – and Co-Founder and Vice Chairperson of the Committee on the Appeal for Human Rights. He earned his Bachelor of Science Degree in Applied Sociology from North Carolina A&T State University. He holds a Master’s Degree from Clark Atlanta University. He was a Fellow at the Harvard Kennedy School Institute of Politics in 1998. In 2006, Commissioner Mack was awarded an Honorary Doctor of Management Degree from the Claremont Graduate University School of Education; and in 2011, he was conferred an Honorary Doctor of Humane Letters Degree by the California State University Board of Trustees at California State University, Los Angeles. During his tenure, the Los Angeles Urban League became one of the most successful non-profit community organizations in Los Angeles with an annual budget of $25 million. The Los Angeles Urban League served over 100,000 individuals each year and operates a number of innovative, result-oriented job training, job placement, education, academic tutorial, youth achievement and business development programs serving African-Americans and other people of color utilizing state of the art computer technology preparing League constituents for the 21st Century. In 1997, United Way presented its Agency of the Year Award to the Los Angeles Urban League. He was the first Urban League Affiliate President to become a Trustee of the National Urban League Board of Directors. Mack was a highly respected advocate for equal opportunities in education, law enforcement and economic empowerment for African-Americans and other minorities – and a bridge builder across all racial, cultural, economic, gender and religious lines. The rare combination of his extraordinary experience and expertise in both civil rights and law enforcement garnered him the coveted Flame Award from the National Association of Civilian Oversight of Law Enforcement in 2014. Mack fought tirelessly for decades to fundamentally change the culture of the LAPD–through litigation, advocacy, community and political pressure, and civilian oversight. As a member and two-term President of the LAPD Board of Police Commissioners from 2005 through 2014, he played a major role in helping the LAPD develop and implement significant reforms of its policies, procedures, and investigations concerning biased policing, and helped the Department achieve full compliance with the federal consent decree that had been in place since 2001. In 2016, Mack was honored by the Los Angeles Business Journal as one of the 500 most influential leaders in Los Angeles.